Theresa and Eric are polar opposites, yet they make a perfect harmony. They’re both creative individuals—she’s a pianist, singer and middle school chorus teacher, and he’s an eye care professional with an artistic talent and an affinity for Marvel comic books. One picks up where the other leaves off—they balance each other and keep one another sane. Theresa fondly describes their relationship as a “comedy of errors.” The two met on Match.com a few years ago, right when Eric was getting fed up with the online dating world. He was reluctant to go on a date with Theresa but he finally agreed and he was immediately smitten. He excitedly called his brother as soon as he got home from their date, to share about the incredible woman he’d just met. We’re excited to share their intimate, musical wedding and are flattered they chose the Proximity Hotel to celebrate their special day. 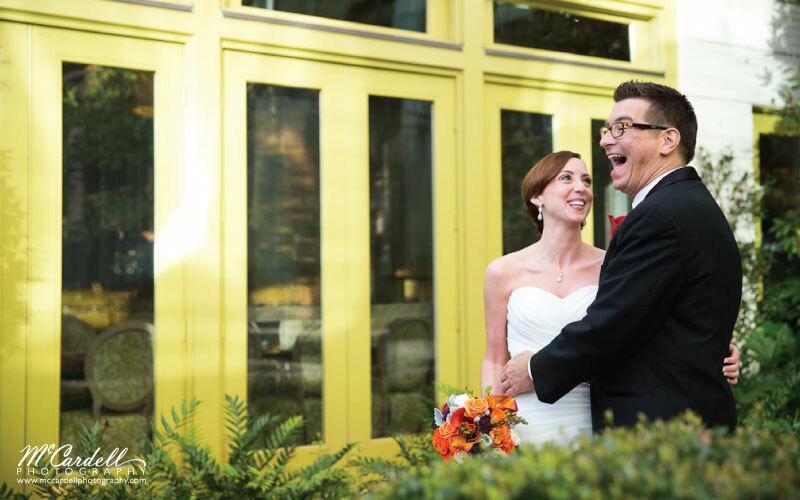 Theresa had always loved the style of the Proximity, and immediately knew it was where she wanted to be married—she and Eric didn’t even need to scout out other venues. She fell in love with the spiral staircase in the Social Lobby, and kept envisioning herself making her entrance down it. 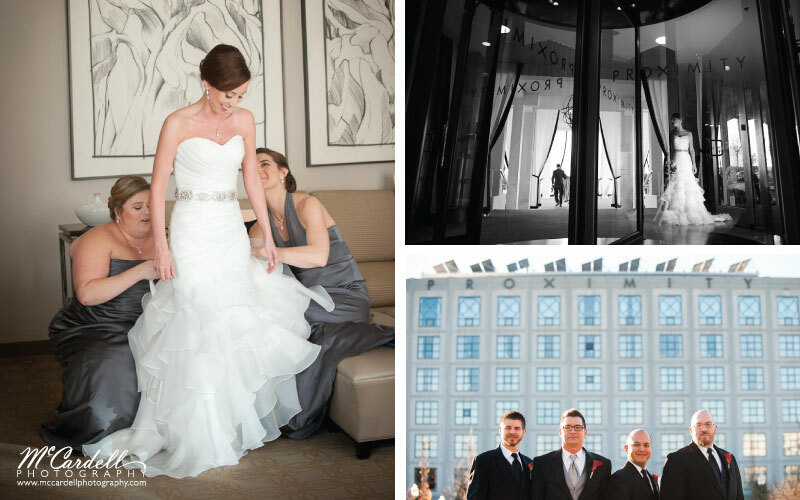 The couple were married on November 23, 2013, before 100 of their closest friends and family. The couple chose to have their ceremony in an intimate round, so that all of their loved ones would feel very included. 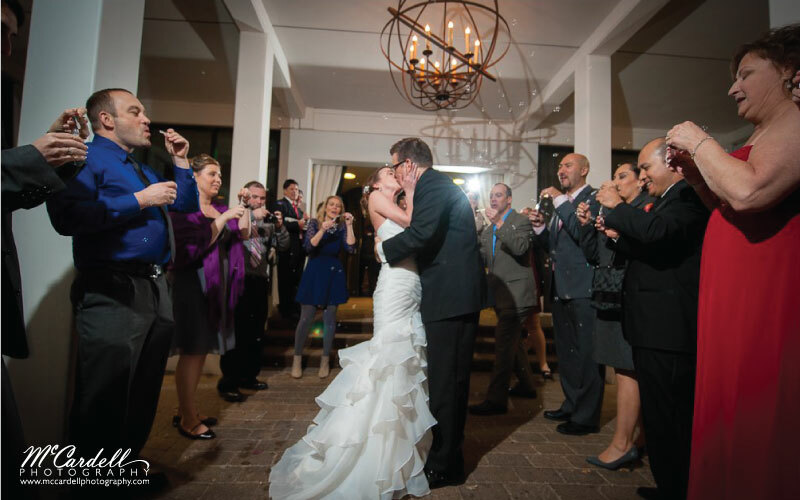 Theresa and Eric were both very involved in the wedding planning process, making every decision together. They wanted to incorporate as many personal details as they could, to ensure their artistic personalities were represented in every element of their big day. 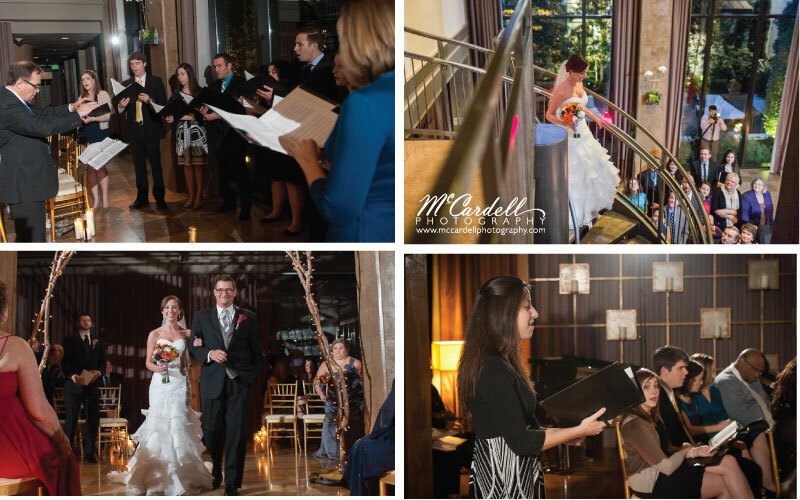 Theresa is a professional musician so having live music was a must for the couple. They gathered a choir of nine singers (all friends), one violinist, and two pianists, and had a grand piano brought in for an added touch of class to the Social Lobby. Instead of a traditional prelude, the musicians performed a combination of classical and Broadway music. After the couple said their vows, the choir sang a classical piece called “Set Me as a Seal,” from A New Creation by Rene Clausen, which contains text from Song of Solomon. In lieu of the minister reading a final blessing, the choir sang it in the form of an Irish blessing that was very special to Eric’s family, who has an Irish background. Theresa’s mother also surprised her by framing an ivory rose that once belonged to Theresa’s grandmother (given to her by Theresa’s father, when he was stationed overseas in the Navy). She kept it for 12 years, as a surprise for Theresa. Theresa’s bridesmaids help her with her dress in a Proximity Suite. Theresa waits just inside Proximity’s revolving door, and Eric and his best men pose in front of the hotel with the cool solar panels on top. 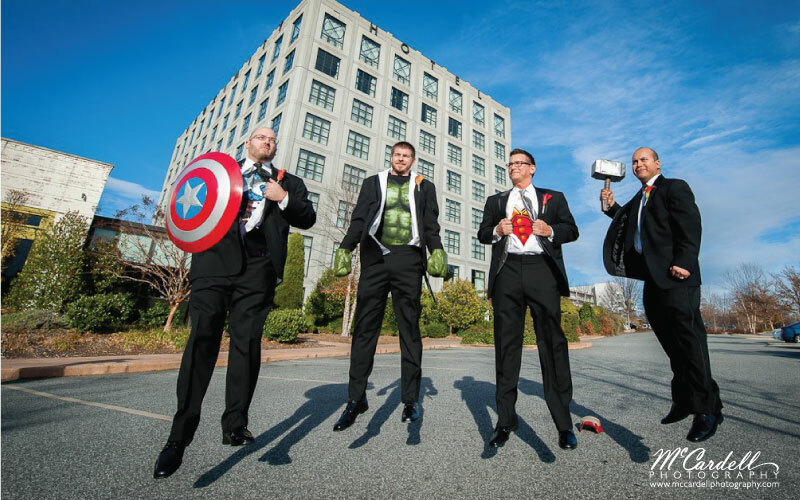 Eric and his best men do their best super hero impersonations, outside the hotel. Theresa and Eric Teaser from HoneyDew Films on Vimeo. The ecstatic couple share a moment in the Bluebell Garden, as Eric sees his bride for the first time. 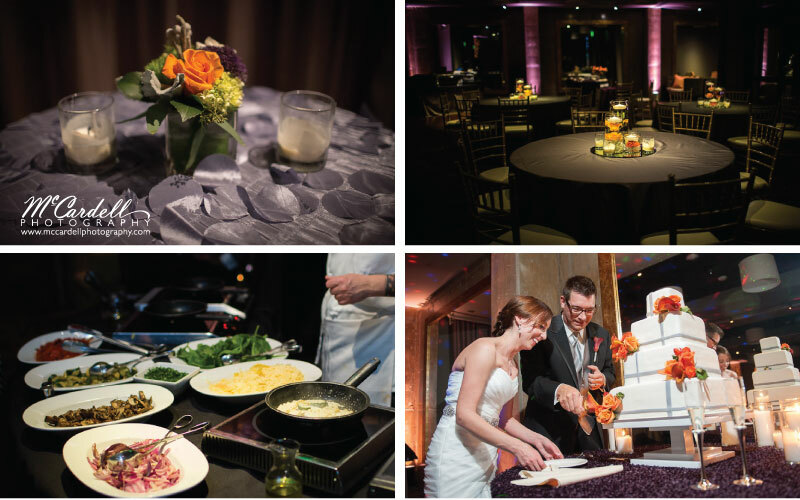 Clockwise: Silver coin linens, votives, and orange floral centerpieces adorned bistro tables in the White Oak Room. Dinner tables were covered with black overlays and pewter taffeta. Dinner included a Mac & Cheese station with a selection of fresh vegetables. The bride and groom cut into their four tiered wedding cake (by The Sweeter Side). Eric and Theresa knew they wanted a fall wedding and they chose pewter and orange, with pops of purple accents to compliment their autumnal look. Proximity Hotel’s resident florist Brenda McLamb arranged orange roses, calla lilies and freesia, and purple trichelum, dusty miller and brunia berries were arranged throughout the Social Lobby and the White Oak Room. 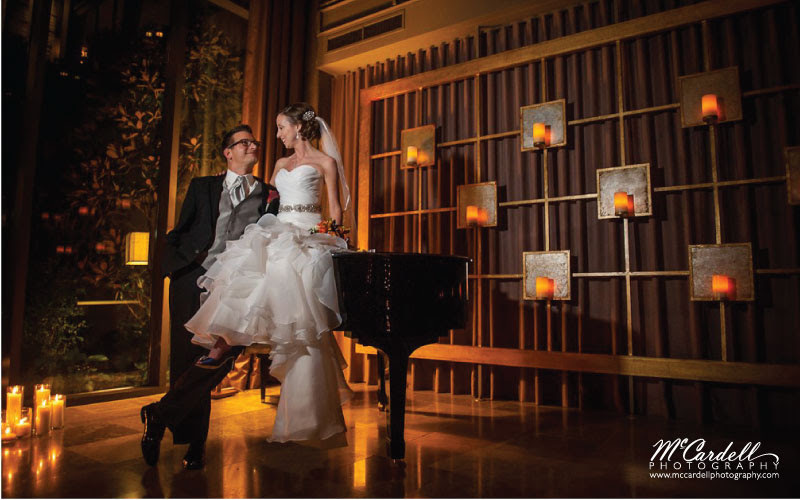 Theresa and Eric pose atop the elegant baby grand they rented, in the Social Lobby. 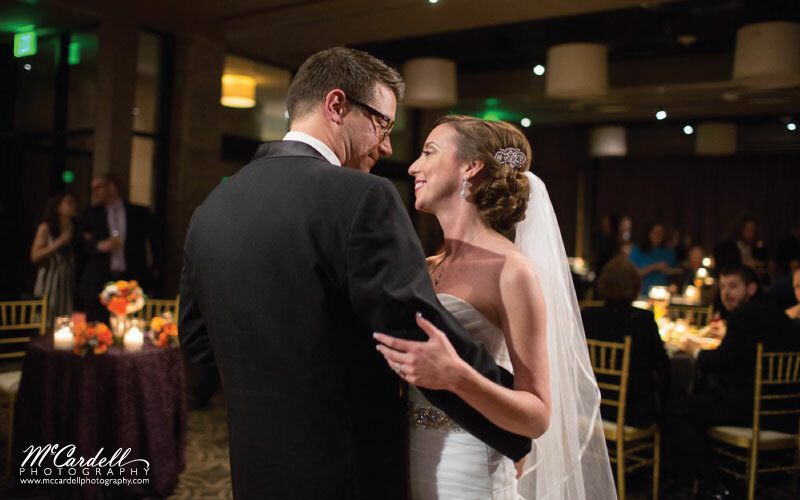 Eric and Theresa savor their newly wedded bliss, over a dance. Since Eric is from Pennsylvania, and Theresa’s from Virginia, many of their guests were coming from out of town, and the couple wanted to give their friends and family a proper NC welcoming. They organized bags with an assortment of fun goodies native to NC. Keeping with Theresa’s wedding colors, and the Proximity’s green-friendly philosophy, they filled up pewter colored recyclable bags with roasted peanuts, Moravian cookies, Lance Crackers, Gatlyn’s Gourmet Popcorn, and Krispy Kreme Doughnuts. 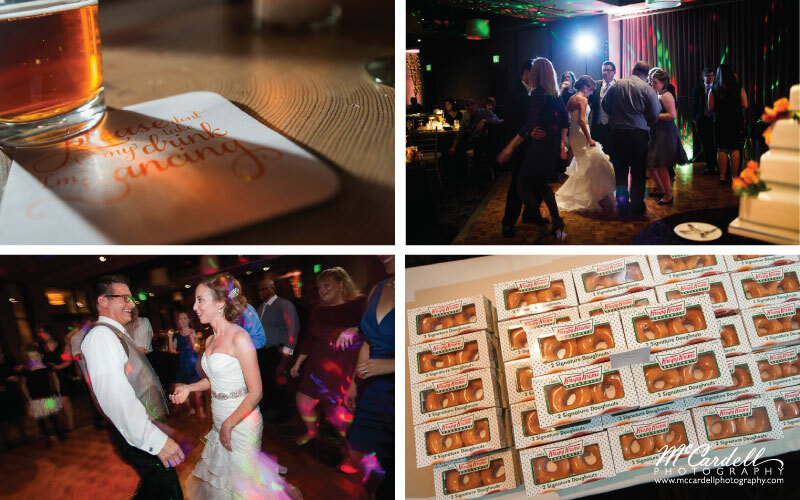 Custom-made coasters read “Please don’t take my drink, I’m dancing.” Guests get down on the dance floor, the bride and groom let loose, and boxes of Krispy Kreme Doughnuts await guests at the end of the night. A cinematic kiss to end a perfect night. you made running a blog glance easy. The whole look of your site is magnificent, let alone the content material!